This article is about the Inca emperor. For a mountain in the Cusco Region, Peru, see Atawallpa (Cusco). For the Bolivian province, see Atahuallpa Province. Before Huayna Capac died in Quito (possibly due to smallpox), he appointed Ninan Coyuchi and Yao as his successor. Ninan also died of the same disease, without his father's knowledge. The Cusquenian nobles named Huáscar (another son of Huayna) as Sapa Inca, and he appointed his brother Atahualpa as governor of Quito. Huáscar declared war on Atahualpa, for fear that he would try to carry out a coup d'état against him. 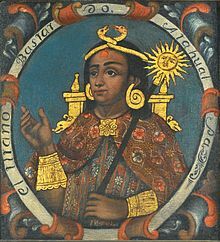 Atahualpa became Inca emperor after he defeated and imprisoned Huáscar and massacred any pretenders to the throne at the close of the civil war. Later, while imprisoned by the Spaniards, Atahualpa gave orders to kill Huáscar in Jauja, thinking Huáscar would use the Spaniards as allies to regain his throne. During the Spanish conquest, the Spaniard Francisco Pizarro captured Atahualpa and used him to control the Inca Empire. Eventually, the Spanish executed Atahualpa, effectively ending the empire. A succession of emperors, who led the Inca resistance against the invading Spaniards, claimed the title of Sapa Inca as rulers of the Neo-Inca State, but the empire began to disintegrate after Atahualpa's death. Throughout the Inca Empire's history, each Sapa Inca worked to expand the territory of the empire. When Pachacuti, the 9th Sapa Inca ruled, he expanded the Empire to northern Peru. At this point, Pachacuti sent his son Tupac Inca Yupanqui to invade and conquer the territory of present-day Ecuador. News of the expansion of the Inca reached the different tribes and nations of Ecuador. As a defense against the Inca, the Andean chiefdoms formed alliances with each other. After Huayna Capac died in 1525, Atahualpa was appointed governor of Quito by his brother Huáscar. 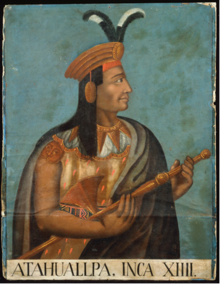 Atahualpa defeated Huáscar's armies, sent because the Inca thought his brother could overthrow him, and in the process conquered and ruled the Inca Empire as Sapa Inca. His rule lasted only a few months before he was captured by the army of Francisco Pizarro, who sided with the Cuzco supporters of the executed Inca Huáscar. The Spanish conquerors executed Atahualpa in July 1533. Huáscar saw Atahualpa as the greatest threat to his power, but did not dethrone him to respect the wishes of his late father. A tense five-year peace ensued, Huáscar took advantage of that time to get the support of the Cañari, a powerful ethnic group that dominated extensive territories of the north of the empire and maintained grudges against Atahualpa, who had fought them during his father's campaigns. By 1529, the relationship between both brothers was quite deteriorated. According to the chronicler Pedro Pizarro, Huáscar sent an army to the North that ambushed Atahualpa in Tumebamba and defeated him. Atahualpa was captured and imprisoned in a “tambo” (roadside shelters built for the Chasqui) but succeeded in escaping. During his time in captivity, he was cut and lost an ear. From then on, he wore a headpiece that fastened under his chin to hide the injury. But, the chronicler Miguel Cabello de Balboa said that this story of capture was improbable because if Atahualpa had been captured by Huáscar's forces, they would have executed him immediately. Atahualpa returned to Quito and amassed a great army. He attacked the Cañari of Tumebamba, defeating its defenses and leveling the city and the surrounding lands. He arrived in Tumbes, from which he planned an assault by rafts on the island Puná. During the naval operation, Atahualpa sustained a leg injury and returned to land. Taking advantage of his retreat, the "punaneños" (inhabitants of Puña) attacked Tumbes. They destroyed the city, leaving it in the ruined state recorded by the Spaniards in early 1532. The Atahualapite forces continued to be victorious, as a result of the strategic abilities of Quisquis and Calcuchimac. Atahualpa began a slow advance on Cuzco. While based in Marcahuamachuco, he sent an emissary to consult the oracle of the Huaca (a god) Catequil, who prophesied that Atahualpa's advance would end poorly. Furious at the prophecy, Atahualpa went to the sanctuary, killed the priest, and ordered the temple to be destroyed. During this period, he first learned that Pizarro and his expedition had arrived in the empire. Atahualpa's leading generals were Quizquiz, Chalkuchimac, and Rumiñawi. In April 1532, Quizquiz and his companions led the armies of Atahualpa to victory in the battles of Mullihambato, Chimborazo and Quipaipan. The Battle of Quipaipan was the final one between the warring brothers. Quizquiz and Chalkuchimac defeated Huáscar's army, captured him, killed his family, and seized the capital, Cuzco. Atahualpa had remained behind in the Andean city of Cajamarca, which is where he encountered the Spanish, led by Pizarro. In January 1531, a Spanish expedition led by Francisco Pizarro, on a mission to conquer the Inca Empire, landed on Puná Island. Pizarro brought with him 169 men and 69 horses. [page needed] The Spaniards headed south and occupied Tumbes, where they heard about the civil war that Huáscar and Atahualpa were waging against each other. About a year and a half later, in September 1532, after reinforcements arrived from Spain, Pizarro founded the city of San Miguel de Piura, and then marched towards the heart of the Inca Empire, with a force of 106 foot-soldiers and 62 horsemen. Atahualpa, in Cajamarca with his army of 80,000 troops, heard that this party of strangers was advancing into the empire, and sent an Inca noble to investigate. The noble stayed for two days in the Spanish camp, making an assessment of the Spaniards' weapons and horses. Atahualpa decided that the 168 Spaniards were not a threat to him and his 80,000 troops, so he sent word inviting them to visit Cajamarca and meet him, expecting to capture them. Pizarro and his men thus advanced unopposed through some very difficult terrain. They arrived at Cajamarca on 15 November 1532. Atahualpa and his army had camped on a hill just outside Cajamarca. He was staying in a building close to the Konoj hot springs, while his soldiers were in tents set up around him. When Pizarro arrived in Cajamarca, the town was mostly empty except for a few hundred acllas. The Spaniards were billeted in certain long buildings on the main plaza, and Pizarro sent an embassy to the Inca, led by Hernando de Soto. The group consisted of 15 horsemen and an interpreter; shortly thereafter de Soto sent 20 more horsemen as reinforcements in case of an Inca attack. These were led by his brother, Hernando Pizarro. The following day, Atahualpa left his camp at midday, preceded by a large number of men in ceremonial attire; as the procession advanced slowly, Pizarro sent his brother Hernando to invite the Inca to enter Cajamarca before nightfall. Atahualpa entered the town late in the afternoon in a litter carried by eighty lords; with him were four other lords in litters and hammocks and 5–6,000 men carrying small battle axes, slings, and pouches of stones underneath their clothes. "He was very drunk from what he had imbibed in the [thermal] baths before leaving as well as what he had taken during the many stops on the road. In each of them he had drunk well. And even there on his litter he requested drink." The Inca found no Spaniards in the plaza, as they were all inside the buildings. The only man to emerge was the Dominican friar Vincente de Valverde with an interpreter. Although there are different accounts as to what Valverde said, most agree that he invited the Inca to come inside to talk and dine with Pizarro. Atahualpa instead demanded the return of every thing the Spaniards had taken since they landed. According to eyewitness accounts, Valverde spoke about the Catholic religion but did not deliver the requerimiento, a speech requiring the listener to submit to the authority of the Spanish Crown and accept the Christian faith. At Atahualpa's request, Valverde gave him his breviary but, after a brief examination, the Inca threw it to the ground; Valverde hurried back toward Pizarro, calling on the Spaniards to attack. At that moment, Pizarro gave the signal; the Spanish infantry and cavalry came out of their hiding places and charged the unsuspecting Inca retinue, killing a great number while the rest fled in panic. Pizarro led the charge on Atahualpa, but captured him only after killing all those carrying him and turning over his litter. Not a single Spanish soldier was killed. When questioned about his age Atahualpa answered "We do not use this western way of calculating time; but I can tell you that my life has seen 31 harvests since I was born, thanks to my mother's help in telling me of my beginnings." Following his execution, his clothes and some of his skin were burned, and his remains were given a Christian burial. Atahualpa was succeeded by his brother, Túpac Huallpa, and later by another brother Manco Inca. It was after the death of Pizarro, Inés Yupanqui, the favorite sister of Atahualpa, who had been given to Pizarro in marriage by her brother, married a Spanish cavalier named Ampuero and left for Spain. They took her daughter by Pizarro with them, and she was later legitimized by imperial decree. Francisca Pizarro Yupanqui married her uncle Hernando Pizarro in Spain, on 10 October 1537—they had a son, Francisco Pizarro y Pizarro. The Pizarro line survived Hernando's death, although it is extinct in the male line. Pizarro's third son, by a relative of Atahualpa renamed Angelina, who was never legitimized, died shortly after reaching Spain. Another relative, Catalina Capa-Yupanqui, who died in 1580, married a Portuguese nobleman named António Ramos, son of António Colaço. Their daughter was Francisca de Lima who married Álvaro de Abreu de Lima, who was also a Portuguese nobleman. The most notable football stadium in Ecuador is named Estadio Atahualpa, located in Quito. On the facade of the Royal Palace of Madrid there is a statue of the Inca emperor Atahualpa, along with another of the Aztec emperor Moctezuma II, among the statues of the kings of the ancient kingdoms that formed Spain. The burial site of Atahualpa is unknown, but historian Tamara Estupiñán argues it lies somewhere in modern-day Ecuador. She argues he was buried in Ecuador for safekeeping. The location is named Malqui-Machay, which in Quechua translates to "mummy", and stone walls and trapezoidal underground water canals were found in this location. More serious archaeological excavation needs to be done to confirm Estupiñán's beliefs. Atahualpa Inca's conflict with Pizarro was dramatized by Peter Shaffer in his play The Royal Hunt of the Sun, which originally was staged by the National Theatre in 1964 at the Chichester Festival then in London at the Old Vic. The role of Atahualpa was played by Robert Stephens and by David Carradine (who received a Tony Award nomination) in the 1965 Broadway production. Christopher Plummer was Atahualpa in the 1969 movie version of the play. ^ Some sources indicate Atahualpa was named after St. John the Baptist and killed on 29 August, the feast day of John the Baptist's beheading. Later research has proven this account to be incorrect. ^ Hewett 1968, p. 171. ^ Veatch 1917, p. 60. ^ a b Hemming 1993, p. 557, footnote 78. ^ Hemming 1993, p. 28. ^ Rostworowski 2001, p. 80. ^ a b Rostworowski 2001, p. 199. ^ Sosa Freire 1996, pp. 39-40. ^ Espinoza Soriano 1997, p. 105. ^ Herrera Cuntti 2004, p. 405. ^ Pease García-Yrigoyen 1972, p. 97. ^ Quilter 2014, p. 280. ^ Bauer 2005, pp. 4–8. ^ Prescott 1892, pp. 312–317. ^ Prescott 1892, p. 364. ^ Hemming 1993, pp. 28–29. ^ Hemming 1993, p. 29. ^ Hemming 1993, pp. 31–32. ^ Hemming 1993, p. 32. ^ Hemming 1993, pp. 32–33. ^ Hemming 1993, pp. 33, 35. ^ Hemming 1993, pp. 34–35. ^ Hemming 1993, p. 36. ^ Hemming 1993, p. 39. ^ Hemming 1993, pp. 38–39. ^ Hemming 1993, p. 40. ^ Hemming 1993, pp. 40–41. ^ De Betanzos 1996, p. 263. ^ Hemming 1993, p. 41. ^ Hemming 1993, p. 42. ^ Hemming 1993, pp. 42, 534. ^ Hemming 1993, pp. 42, 534–35. ^ Hemming 1993, pp. 42–43. ^ Hemming 1993, p. 43. ^ Hemming 1993, pp. 39–40. ^ Hemming 1993, pp. 49, 536. ^ Hemming 1993, p. 79. "Traitor Ruminaui hearing of the Inca's death fled to Quito where the remaining hoard of the Kings ransom gold was kept in trust by Quilliscacha who now on Atahualpa last wishes was now Inca, but was killed by Ruminaui. Ruminaui killed the Royal Inca descendants for his own greed." ^ Prescott 1892, pp. 438, 447, 449. ^ Prescott 1847, p. 111. ^ "Atahualpa, Last Inca Emperor". Archaeology. 16 July 2013. ^ Caselli, Irene (12 May 2012). "Ecuador searches for Inca emperor's tomb". BBC News. Retrieved 24 July 2018. Brundage, Burr Cartwright (1963). Empire of the Inca. Norman, OK: University of Oklahoma Press. ISBN 9780806119243. De Betanzos, Juan (1996). Narrative of the Incas. Translated by Hamilton, Roland; Buchanan, Dana. University of Texas Press. ISBN 9780292755598. Hemming, John (1993). The Conquest of the Incas. London: Macmillan. ISBN 0333106830. Hewett, Edgar Lee (1968). Ancient Andean Life. Biblo & Tannen Publishers. ISBN 9780819602046. Retrieved 24 July 2018. Prescott, William H. (13 October 1998). The Discovery and Conquest of Peru. Modern Library. ISBN 9780679603047. Rostworowski, Maria (1998). History of the Inca Realm. Translated by Iceland, Harry B. Cambridge: Cambridge University Press. ISBN 9780521637596. Rostworowski, Maria (2001). Pachacutec Inca Yupanqui (in Spanish). Instituto de Estudios Peruanos. ISBN 9972510603. MacQuarrie, Kim (2008). The Last Days of The Incas. Piatkus Books. ISBN 9780749929930. Sosa Freire, Rex (1996). Miscelánea histórica de Píntag (in Spanish). Cayambe: Editorial Abya Yala. ISBN 9978042016. "Atahualpa" . Appletons' Cyclopædia of American Biography. 1900.